Even if you don’t know the name of Bert Berns, chances are you know the songs he wrote (»Twist and Shout«, »I Want Candy«, »Hang On, Sloopy«, »Piece of My Heart«), produced (»Under the Boardwalk«, »Baby I’m Yours«, »Brown-Eyed Girl«, »Here Comes the Night«) and oversaw as head of Bang Records (»Cherry, Cherry«, »Solitary Man« and the rest of Neil Diamond’s earliest recordings). Though Berns died in the final days of 1967 at just 38 years of age, a year hasn’t gone by since when his songs haven’t been recorded and played. He finally has gotten his due in recent years with Joel Selvin’s biography Here Comes the Night, the off-Broadway bio-musical Piece of My Heart, and most notably with an acclaimed documentary BANG! 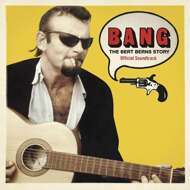 The Bert Berns Story, directed by Bert’s son Brett Berns and Bob Sarles. Earlier this year, the hard-hitting film narrated by Little Steven Van Zandt received a digital-only soundtrack release.